In the past, I have always hated Thanksgiving. With all the emphasis on cooking and eating rich foods, I was always overcome with anxiety and food fears-gratitude was nowhere to be found. But this time was different for several reasons. One, my mom and I decided to have a healthier menu than usual. I actually do not usually enjoy really rich foods, because I do not like the way they make my body feel, so I was excited to be cooking lighter fare. The food still tasted great-in fact, I thought some of the foods, like the little, golden potatoes tasted better than the traditional fare-after so many years of having rich mashed potatoes, it's nice to have a change. Two, my brother is home. He lives on the other side of the country, so I don't get to see him that often, but I love spending time with him. And three, I made a conscious decision to focus on being grateful this year, instead of focusing on the food. Sure, I cooked a lot-I made pumpkin muffins, cranberry sauce, stuffing...but I didn't dwell on what I was making too much and when I found my thoughts turning to thinking about calories or weight, I decided to ask myself to name something that I was grateful for instead. This way of thinking helped keep me happy, instead of the ball of anxiety that I usually am at this time of year. And I am thankful for a lot: my brother being home; that my parents and I have a good relationship; that my dad and brother cleaned up the kitchen, so I could get some rest; for having warm shelter and plenty of food; for my medication and the stability it provides; and for my serenity this day. I thought I would share with you some of my favorites this year. "Decadent Pumpkin Muffins" from allrecipes.com. 1. Preheat the oven to 350 degrees. Line muffin tins with liners. 2. In a medium bowl, mix the flour, baking soda, salt, baking powder, nutmeg, allspice, cinnamon, and cloves. In a large bowl, mix the pumpkin, sugar, applesauce, yogurt, and eggs. Blend the mixtures and add the water to make it smooth. Transfer to the muffin pans. 3. Bake 16 to 18 minutes. The recipe states that the batter makes 24 muffins, but I made 30! However, I am not sorry, because these muffins really did taste decadent! 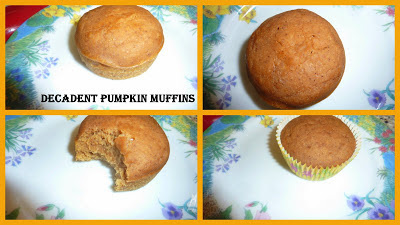 I was a little skeptical of the recipe, because it was so healthy, but these muffins were incredibly moist and flavorful. Smelling the cinnamon and other spices as I took them out of the oven was a treat in itself too! This recipe is definitely a keeper. Now for the little, golden potatoes. Just buy a bag and dump them onto a cookie sheet. Coat them with olive oil, rosemary, salt and pepper and bake them twenty minutes at 425 degrees. Be careful when you eat them-they'll stay hot for a long time. These bite sized gems also smelled good, thanks to the rosemary, and were a delightful change of pace from the usual mashed potatoes. These were soft and salty tasty treats. This was my mom's own recipe. Stir together ingredients on the stove and turn heat on high until mixture reaches a boil. Once it comes to a rolling boil, turn the heat down to medium low and continue cooking over lower heat for about 10 minutes, or until the juice is thick. Turn off the heat. This recipe is not so healthy as there's so much sugar, but it's so good and beautiful that I think it's worth it. I've made it for several years now. 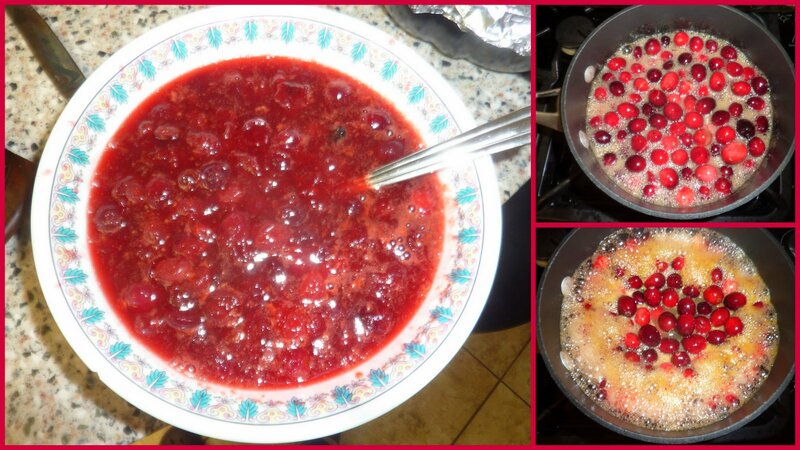 Cranberries always make me feel festive-soon it will be time to make my famous cranberry bread. I hope everyone had a good Thanksgiving, free from body policing, eating anxieties, and food fears, although I know that that is a lot to ask. If not, then take a deep breath and think of one thing that you are thankful for-even if it's just the fact that Thanksgiving comes once a year. I am so glad to say that I am thankful for a lot this year-I hope you are too.